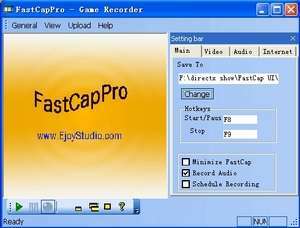 FastCap is a smart PC game and movie recorder to record and compress video and audio on the fly while you are playing them! FastCap will not laggard down your PC much even when you record at high FPS. It can generate vivid movie of your 2D or 3D Games with frame size bulk up to 1152 x 864 or diminutive frame size (e.g. FastCap 1.4.7 is a shareware program and can be used as a demo to try the software until the free trial period has ended. A full version of the program is available after the trial period ends. For security reasons, you should also check out the FastCap download at LO4D.com which includes virus and malware tests. Additional screenshots of this application download may be available, too. FastCap has a presence on social networks.